Sandy and Brent H. in Northport, Alabama, are wonderful, truly hospitable Southern folks. They’ve been customers for several years now. As you can see in this photo, their home is filled with quite a large collection of beautiful French antique furniture. 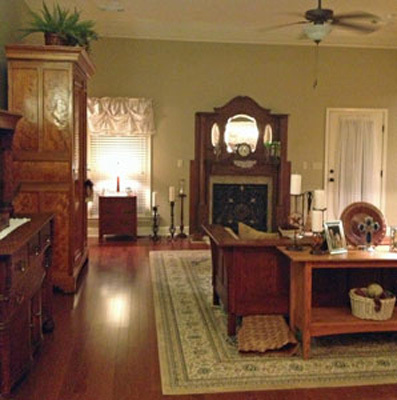 They especially gravitate toward French Country and Arts and Crafts styles. We first met Sandy and Brent back in 2010 when they purchased a charming French Country Secretary Desk. (It’s the perfect place to practice the vintage art of letter writing!) The secretary desk looks wonderful in a corner of one of the bedrooms, paired with a Louis XVI style armchair. 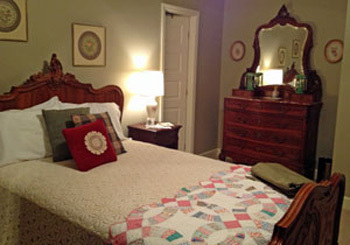 Sandy & Brent tell us they’ve enjoyed receiving our newsletters ever since that first purchase, and in a 2012 newsletter they spotted a Louis XV Bed that now occupies one of their guest rooms. When we said we also had a matching armoire and vanity with a pretty orangey-red marble top, they just couldn’t resist bringing the whole set home. Due to the fragile nature of the vanity mirror and because Sandy and Brent were within driving distance, Greg and I decided to personally deliver the antique Louis XV bedroom set. Sometimes it is nice to get out of the office and meet our customers in person! Sandy recognized us immediately from our photos on the website and was a very gracious hostess. We couldn’t help ooohing and aaahing over her collection, and particularly liked the heavily carved antique Hall Bench in the foyer with antique stained glass panels hung above. 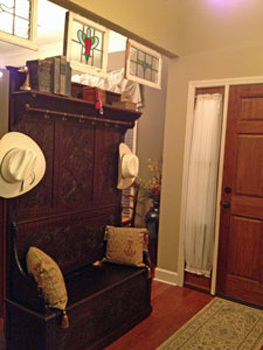 Can you tell Brent hails from Texas with his cowboy hats on display? That bedroom set didn’t have a nightstand, so Sandy and Brent asked us to keep an eye out for an antique Louis XV nightstand that would match their French Country bedroom suite. 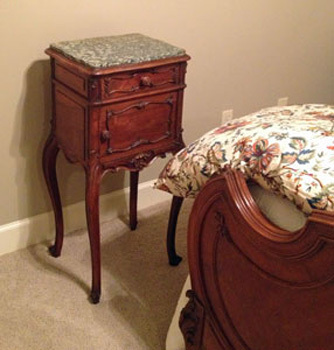 About six months later, we found a gorgeous green-marble topped nightstand that was a wonderful match. We sent the photo to Sandy & Brent while we waited for the container to arrive in the US. The photo showed the whole Louis XV bedroom suite – and it happened again! Sandy and Brent fell in love with the whole set and just had to bring that one home too! 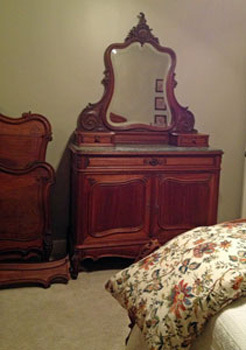 This new set included an armoire, full-size bed, green marble-topped vanity, and nightstand. 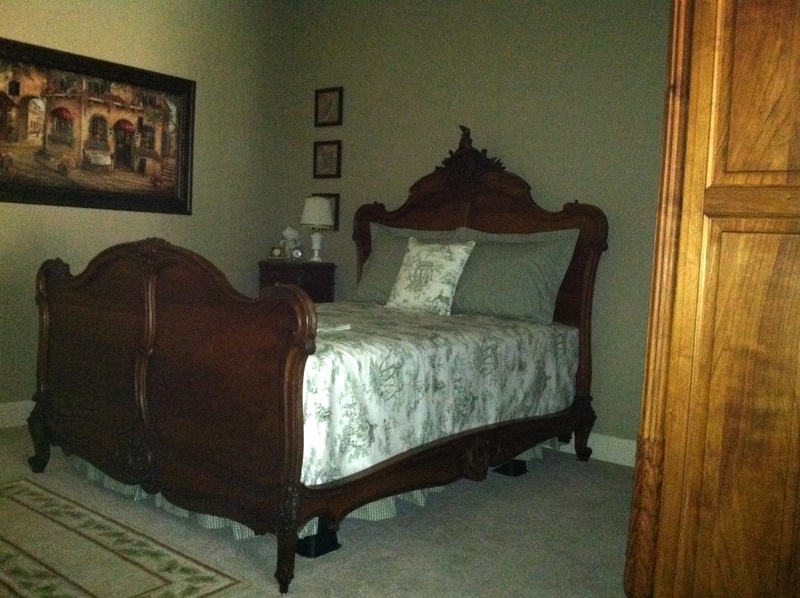 Brent and Sandy already had another Louis XV bed set up in their second guest room, but were planning to move it to a room that was currently being used as an office. 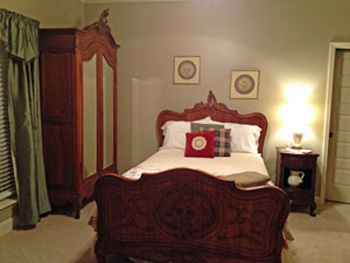 We set up the armoire in the office room and then set up the vanity in the second guest room. We left the bed against the wall at their request. Sandy just sent us a photo of the bed set up in its new home with beautiful green striped bedding that matches the marble on the vanity and nightstand. Of course the biggest surprise was that Sandy had dinner waiting for us upon our arrival! She prepared a delicious pot roast with carrots and potatoes and even baked a cake with scrumptious home-made icing. What a fantastic treat for us and how very kind and thoughtful of Sandy! We truly appreciate our customers at EuroLux Antiques – another big shout out of thanks to Sandy and Brent! Browse our current selection of fine antique furniture, including many gorgeous French Country style pieces. To receive our monthly newsletter showcasing the latest antique furniture, vintage lighting, high-quality reproduction furniture, and home decor accents, join our mailing list at EuroLuxAntiques.com. 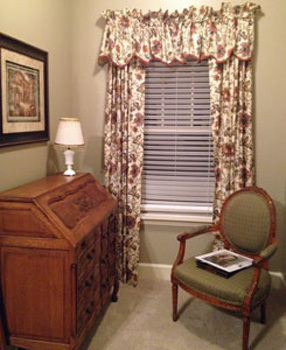 This entry was posted in Client Spotlight and tagged Alabama, antique desk, Antique Furniture, Antique Louis XV Bedroom Suite, antique sideboard vanity, armoire, EuroLux Antiques, French Antique Furniture, French Country, how to blend antiques into decor on May 28, 2013 by admin.